Cinnamon Golden Milk Latte, a warming turmeric latte recipe made with ground turmeric, ginger, coconut, and black pepper. An easy self-care ritual drink that is healthy AND tastes delicious! Are you golden milk latte obsessed? Nothing beats a warm and soothing turmeric-based latte for a mid-morning or afternoon pick-me-up. 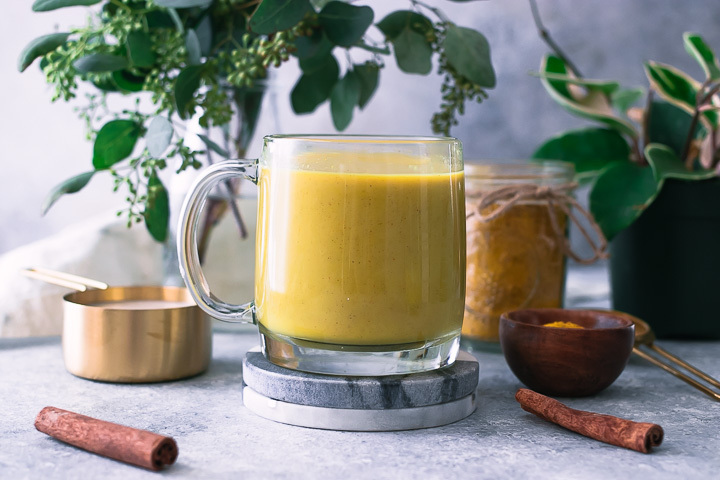 And don’t forget that golden milk is also a great nighttime self-care ritual, which means that golden milk is the perfect antioxidant-rich drink for any time of day. 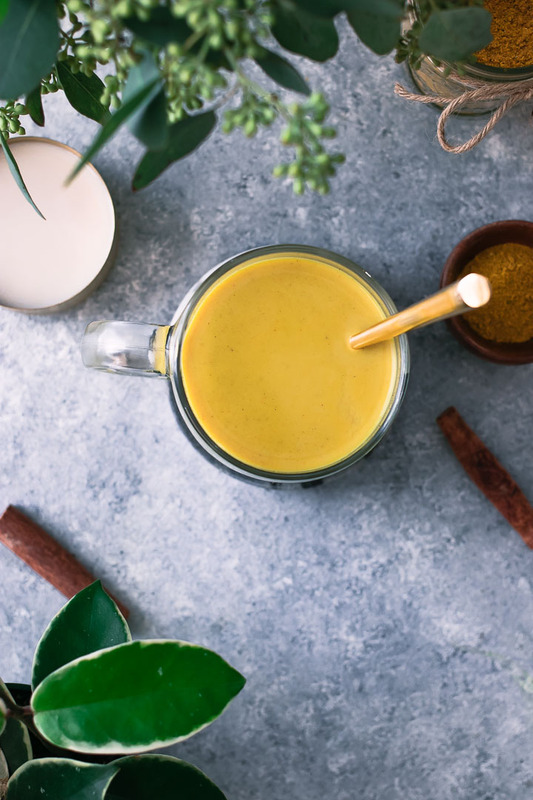 While turmeric is the foundation of golden milk, adding a few additional spices can take the traditional Ayurvedic beverage next level — specifically a dash of cinnamon, cardamom, nutmeg, and vanilla. Ready for your new favorite plant-based ritual drink recipe that’s ready in under 5 minutes? Let’s do it! What is a golden milk latte? What are its health benefits? Golden milk, or turmeric tea, is a traditional Ayurvedic recipe made with antioxidant-rich turmeric that has been enjoyed for centuries. 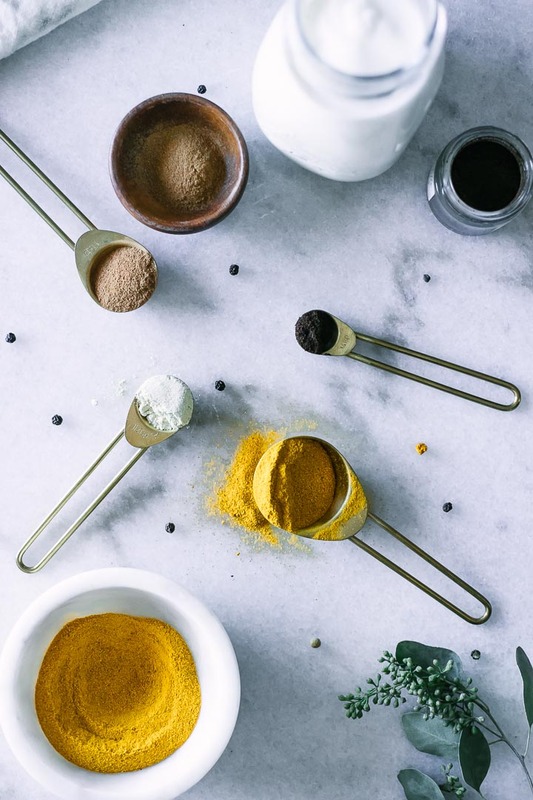 It is thought to have anti-inflammatory health benefits because of the turmeric and other spices, and has now become a trendy wellness ritual enjoyed across the world. 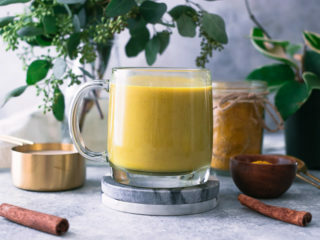 While there are many variations of golden milk recipes, they all contain turmeric as the foundation and usually also have coconut (sometimes in the form of coconut milk or coconut oil) and black pepper. Other recipes add more spices as well, including cinnamon, ginger, cardamom, and nutmeg. I have tried experimented with many different golden milk recipe variations, and my favorite blend includes turmeric, ginger, coconut, black pepper, cardamom, nutmeg, cinnamon, and vanilla. Each one of these delicious spices on its own is full of antioxidants, but together they add up to be a powerfully nourishing drink that not only tastes good, but makes you feel good as well. Turmeric powder is the foundation of golden milk and is what gives it its bright yellow color. Turmeric is a root in the same family as ginger and galangal, and is grown in India and parts of Southern Asia. Studies have shown that curcumin, the bioactive compound in turmeric, may have anti-inflammatory factors that may improve joint pain, skin irritation, and may even reduce the risk of heart disease. Ground turmeric, and golden milk, have long been used in Ayurvedic medicine. Ginger is a cousin of turmeric, and is a flowering perennial plant with a root that is used in cooking both raw and dried and ground into ginger powder. Ginger is from the southern part of India and Asia, as has long been used to cure nausea and upset stomach, and some studies show that ginger creates a calming effect as consuming. Cinnamon comes from the bark of the Cinnamomum tree species, which is grown in Southern Asia, specifically China and Indonesia. The bark is dried and then ground to produce ground cinnamon, which is commonly used in baked good. Like ginger, cinnamon has a long history of use as a digestive aid and some research suggests it may have anti-inflammatory and anti-bacterial properties. Coconuts are a tropical fruit that come from the palm tree, and are used for their milk, flesh, oils, and even their shells. Coconut powder is made by draining coconut milk and drying coconut flesh, then grinding into a powder. Coconut powder is great in curries, soups, and stews, and mixes well into hot liquids like golden milk. It adds a smooth tropical taste to golden milk. Vanilla plants are actually orchids that grow on a vine and are harvest for their fruit, the vanilla “bean” pod that can be scraped to release its tiny black seeds. Vanilla originated in Mexico, but is now grown across the world in tropical regions in places like Madagascar and Tahiti. Vanillas is most often used in baked goods, but its’ extract is also delicious in drinks like lattes. Cardamom is a strong spices made from the small pods of the Zingiberaceae plant species, which is grown in India and Southern Asia. It is used in both sweet and savory Asian cuisines, as well as more widely in baking. Cardamom contains antioxidants which may reduce inflammation and may have antibacterial effects. Nutmeg is made from the ground seed of the Myristica tree, an evergreen tree found in Malaysia, Sri Lanka, and Indonesia. It is used in both sweet and savory dishes worldwide and is used in alternative medicine for pain relief and digestion. Black pepper is the ground spice made from the peppercorn fruit from the Piperaceae plant, which is native to Southern India but is now also grown in Vietnam. It is now a staple spice used in cuisines throughout the world. To make a hot Cinnamon Golden Milk Latte, first add your milk of choice to a sauce pan and heat until almost boiling. Then add in turmeric, ginger powder, coconut powder (or coconut oil), and black pepper and whisk until well combined. Pour into a coffee mug and enjoy! To make an iced Cinnamon Golden Milk Latte, simply add the milk and spices to a cocktail mixer, shake, and pour over ice in a glass. Alternatively you could also add all ingredients to a glass mixing bowl and whisk before pouring over ice. 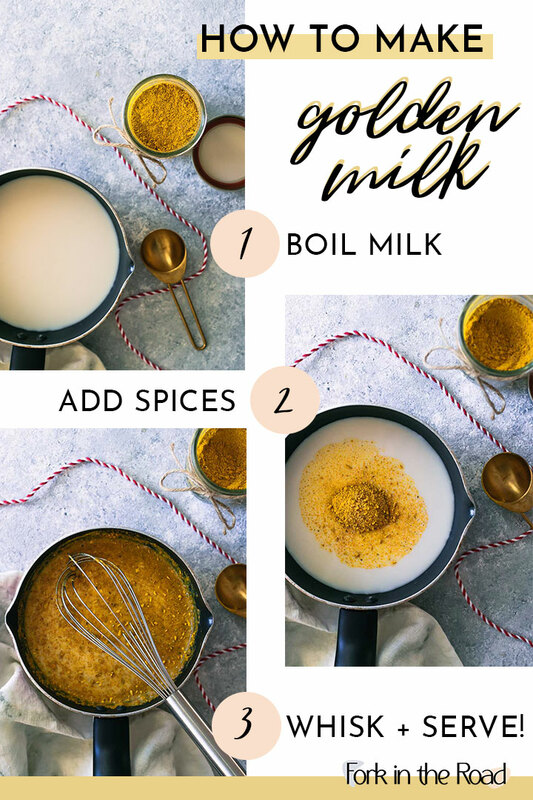 Mix up your golden milk flavors by adding other spices and herbs such as cardamom, nutmeg, cinnamon, or even flavored oils such as peppermint or flavored vanilla extracts. Which milk should you use in golden milk lattes? Any milk will do! I like to use a plant-based milk like pea milk or almond milk, but coconut milk is also a great option for a more tropical coconut-flavored turmeric tea. However, animal-based milks like cow’s or goat’s milk also work well in this recipe. Craving more warm and healthy drinks? Check out our Peppermint Mocha Matcha Latte for a holiday-spiced chocolate-y caffeine buzz. Did you make this Cinnamon Golden Milk Latte? Leave a comment below and rate the recipe to let us know how it turned out. 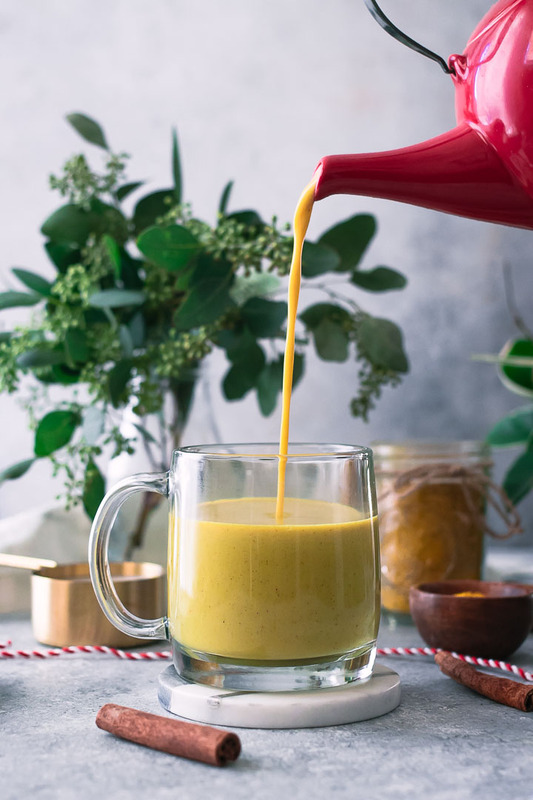 Save this turmeric latte recipe for later by pinning to your favorite winter Pinterest board and make sure to tag me on Fork in the Road’s Instagram to show me your golden milk creations! Add milk of choice to a small saucepan over medium high heat. When milk is almost boiling, add turmeric, ginger powder, cinnamon, coconut powder, vanilla, and black pepper to pot and then mix well with a whisk. Take milk off heat and pour into a coffee or tea mug, top with a sprinkle of cinnamon, and enjoy. Add milk of choice and add turmeric, ginger powder, cinnamon, coconut powder, vanilla, and black pepper to a small mixing bowl or to a cocktail mixer. Shake well to combine, then pour into glass topped with ice. Enjoy! Notes: Save time when making golden milk lattes by pre-mixing your golden milk spice mix and adding 1-2 tablespoons when ready to enjoy. Leftovers and storage: Store extra golden milk in an airtight container in the refrigerator for up to three days to reheat, or drink cold. Nutrition: This Cinnamon Golden Milk Latte recipe is low in sodium, total fat, and contains no added sugar, and is high in protein and calcium (depending on the milk you use). It makes a great antioxidant-rich morning or afternoon pick-me-up, or before bed relaxing ritual drink.